WALWORTH — The start of the season did not exactly go smoothly for the Big Foot softball team, whose record sat at a winless 0-5. However, after losing by only a single run in that fifth game, head coach Troy Hummel could see his team was moving in the right direction heading into their April 9 home game against McFarland. “I knew we were doing a lot of great things, and I felt really confident we could win this game,” Hummel said. His intuition turned out to be spot on, as the Chiefs picked up their first win of the season 9-2. The winning effort started early for the Chiefs, who took a 3-0 lead in the first inning. Lead-off hitter freshman Riley Summers was hit by a pitch, and junior Riley Alness walked to put runners on first and second. Both runners advanced on a wild pitch, and senior Lynda Santiago knocked both base runners in with a double to go ahead 2-0. Santiago then advanced to third on a ground-out before scoring on a single by freshman Mary Davenport to round out the scoring for the frame. After falling behind in the first inning in four of their five losses, getting ahead early made every Big Foot player’s job easier. “It’s a huge benefit to take the lead. It gets a monkey off your back. You don’t have to play with pressure; you play more relaxed,” Hummel said. In the next three innings, neither team was able to scratch a run across, and at the end of the fourth inning, the score was still 3-0. McFarland was able to kick-start its offense in the top of the fifth inning, scoring a pair of runs on a walk and two singles to cut the score to 3-2. Big Foot recovered in the bottom of the fifth inning, scoring a run to extend its lead to 4-2. Summers started the inning with a double, but advanced to third base courtesy of an error on the play. A few batters later, Santiago smacked a single to score Summers for her third RBI of the game. The Chiefs locked out the Spartans in the top of the sixth, holding them scoreless, and then the floodgates opened in the bottom of the sixth, as Big Foot scored five runs to go ahead 9-2 to ice the game. Junior Lindsay Paulsen started the frame off with an infield hit that ended with her on second base after McFarland overthrew first and the ball went out of play. A pair of Chiefs were then hit by pitches, as freshman Morgan Rego and Summers both got on to load the bases. Alness stepped up and singled to score Paulsen and Rego to put the Chiefs ahead 6-2. Junior Kaleigh Baxter came to the plate next and hit a single that scored Summers to go up 7-2. Santiago walked to load the bases once again, and Davenport picked up an atypical RBI by being hit by a pitch to send Alness home and go up 8-2. After leading off the inning, Paulsen returned to the plate and picked up a walk to drive Baxter home for the final run of the game. After scoring fewer than five runs in three of the first five contests, being able to put up five runs in a single inning could be a major morale booster for the young Chiefs squad. While the team’s hitting improved, the team’s pitchers also made a big improvement, allowing the fewest runs of the season so far. Santiago started the game and pitched 5 and 1/3 innings, only allowing three hits and two runs. Alness came in for the final 1 and 2/3 innings and sealed the victory, only allowing one base runner along the way. Santiago’s 3 RBIs led the way for the Chiefs offensively, but Alness and Davenport were close behind, driving in a pair of RBIs apiece. Baxter and Paulsen both picked up one RBI. Summers did not drive in any runs, but the lead-off hitter did her job and got on base three times, scoring a run each time. Alness was next up with two runs scored, and Baxter, Rego, Paulsen and Santaigo each scored one. Big Foot’s next outing was a doubleheader against Jefferson on April 13, and the games did not go as well as the one against McFarland, with the Chiefs falling in both. In one of the contests, Baxter picked up the only hit for the Chiefs, as Eagles pitcher Claire Beck put on a clinic to clinch a 10-0 five-inning win. The Chiefs kept it closer in the other matchup, though, falling by an 11-6 margin. Big Foot did not ever lead in the game, but the team was able to muster up a pair of multi-run innings, scoring two in the first and three in the fourth. It was a balanced offensive effort, with five different Big Foot players driving in runs, as Santiago, Paulsen, Davenport, and seniors Megan Dykstra and Katie Chalchoff all registered one RBI. 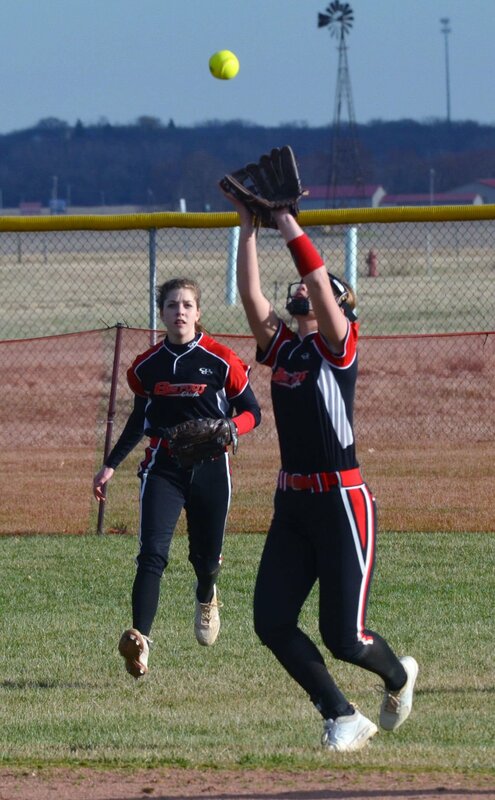 The Chiefs got back on the winning track April 15, heading on the road to Brodhead and spoiling the hospitality with a 19-2 win in five innings. It was a couple of freshman who did the most damage for Big Foot, as Summers and Davenport each drove in four RBIs. For Summers, all of those came on a single hit when she knocked a grand slam out of the park. The slam was her fourth home run of the season, surpassing last year’s team leader Riley Davis’ total of three just halfway through the year. Santiago picked up the win on the mound with two earned runs in five innings of work, striking out five. She also drove in an RBI and scored a run.